On the cinema section of Pavilion, go to Level 4. It is at the end towards the Bukit Bintang side. "Good experience at Ippudo Pavilion"
"The restaurant was pretty packed wh..."
The restaurant was pretty packed when we visited during the first week of their soft opening period, but it wasn’t too long until we got the big table for 6. Upon surveying the menu, the first thing that we noticed was the significantly higher price than all the other Ramen joints, even Hokkaido Santouka, which is also located in Pavilion. A full bowl with everything added will cost you RM36++, that’s pretty steep for noodles. The rent must be super high. The red hue of the broth is tantalising indeed. Upon the first sip, the broth is rich and creamy, with a great mouth feel thanks to the little bits of pork fat (you can definitely see it in the picture), and also bits of ground pork. It’s very aromatic and not too salty, though it can get a little cloying towards the end for some. The spicy note is definitely there but not too strong. You can choose to have your noodles al dente or softer, and we all went for al dente, of course. I enjoyed the noodles, they were cooked perfectly and thus very addictive. There is also the option to add some crushed raw garlic for that extra pungency, but most of us did without. The next 2 component were a little disappointing though. For the egg was hardly flavoured (I suspect it’s not as the white remained completely white), even though the yolk was still perfectly runny. The Pork Belly was not as tender as I expect and lacks in taste compares to the broth. Still it was pleasant enough to eat. This is the classic Hakata-style Ramen. I had a sip of the broth and it was great without the spice too. The taste of seaweed is more prominent here. 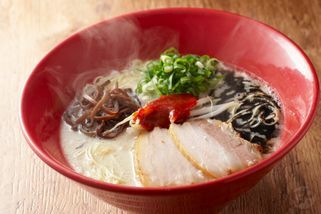 The Akamaru Special features the Original Tonkotsu Broth with Miso Paste and Garlic Oil. I didn’t try this one, but My dining companion commented that the saltiness is slightly more prominent due to the miso paste, and it’s just a little to rich to finish. In fact, none of us did. One thing of note too, the green tea is served per glass and is RM2.50++ each. So savour every sip. The service here can be a little lacking, but that could be teething problem. Just make sure you pay attention to the last call even for your drinks. "Can try at least once and form your own opinion." 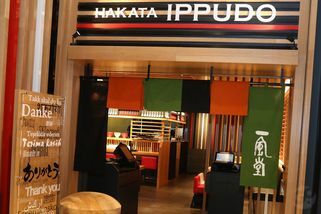 This brand of ramen chain came highly acclaimed and anticipated by many. I must commend that it is amongst the top 3 on my list for a ramen bowl. Tied on the 2nd spot with Santouka, which is also located in Pavilion. Their flavours does not do anything for me, except for their green tea. I really wanted to be wowed when I ventured there on their 2nd day in business. The karashi version which I expected to be spicy was not spicy at all and neither was the chili paste provided. That killed it for me. Granted the ramen texture was definitely up to standard, the soup was rich and flavourful (although it doesn't hit a spot for me) but it was good for some ramen afficionado friends. I guess that weighs positively for this review. My stance is neutral, this place incurs zero craving and I can do without the meal if I am not hungry at all. I was disgruntled that the green tea was RM2.50 per glass having being spoilt by the free pour tea elsewhere. The tea was actually very good, better than any I have ever drank, but I did not go beyond the 2nd glass since I could have easily drank up RM20 worth of tea on a thirsty day, especially after a ramen bowl. They tried to kick us about just before 2pm and refused order of a matcha ice cream at 2:15pm. Perhaps it was a teething issue, I will not condemn it just yet. If ever I am too lazy to cross the road to Marutama, there is a 50% chance that I will be there if I wanted ramen within Pavilion. A ramen bowl here with the full works is RM36, which is twice the price of my favourite ramen bowl elsewhere. I guess you pay the premium for the branded establishment, atmosphere and location, rental cannot be cheap!